Here is great news for all Sri Lankan drivers who own a smartphone as well! 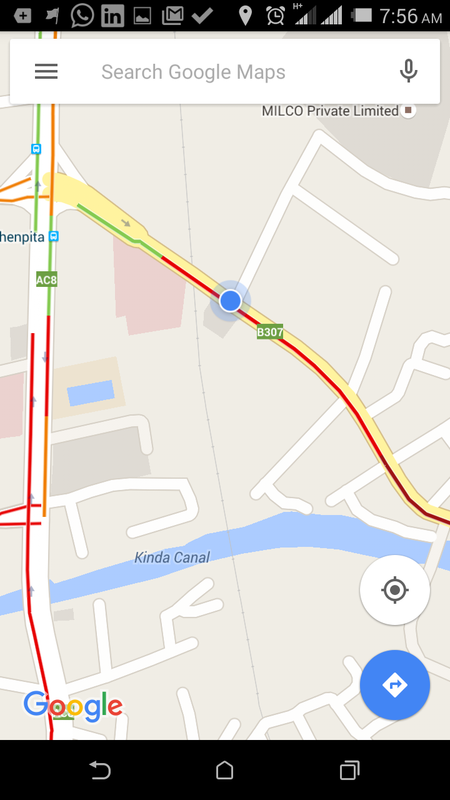 Recently Google enabled their live traffic updates feature on Google maps for Sri Lanka. From now onward, when you check a route on Google maps on a busy Colombo neighborhood, you will see a heat map overlay to signify how intense is the traffic jam on the road you are planning to take. 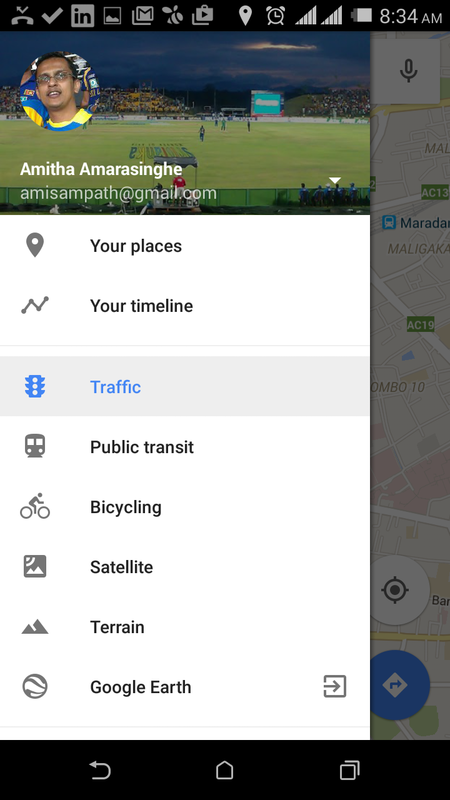 First, you have to enable traffic updates on your Google Maps app. To do this, open the app and slide the screen from left to right. 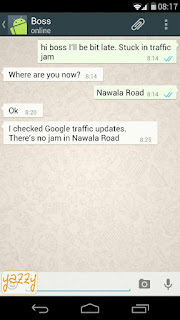 You will get the detailed menu to enable different features of Google Maps and then select “Traffic”. I tested the live traffic updates while I was driving to work this morning and found that it is quite accurate. It shows the intensity of traffic jam in Colombo roads on a heat map overlay from green to red, where red being a high traffic situation. This is really useful to plan your route in advance. You can select an alternate route with less red areas in the traffic map, instead of the usual route you would take. One thing to remember is, the map being red doesn’t necessarily means that the traffic is “jammed”. Basically it’s just an indication of ‘lots of vehicles’ in a particular area, and these vehicles maybe moving in a decent speed. It doesn’t mean the vehicles are in a stand still mode in a traffic jam. For example at this particular point of the route (see below screenshot) my car was moving at an average speed of 25Kmph. This is reasonably a good speed compared to the average speed of vehicles moving inside Colombo city limits during the rush hours. This can be a handy tool for Sri Lanka traffic police, if they really want to do something about the decreasing average speeds of vehicles moving inside Colombo city limits. Two years ago it took me only 30 minutes in morning rush hours to drive from Nugegoda to Barnes Place (approx 10 KM). Now it takes me average 45 minutes. If Sri Lanka Traffic Police deploy some qualified analysts to look at these stats, I’m sure they can come up with optimization plans for traffic in Colombo city, without just blindly making some random roads one-way. I’m sure you might ask me the question ‘how does Google predict traffic jam?’. 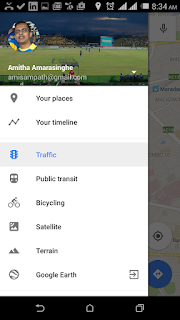 According to HowStuffWork.com Google Maps bases its traffic views and faster-route recommendations on two different kinds of information: historical data about the average time it takes to travel a particular section of road at specific times on specific days and real-time data sent by sensors and smartphones that report how fast cars are moving right then. This is what Google has to say about how they do this. Oh! 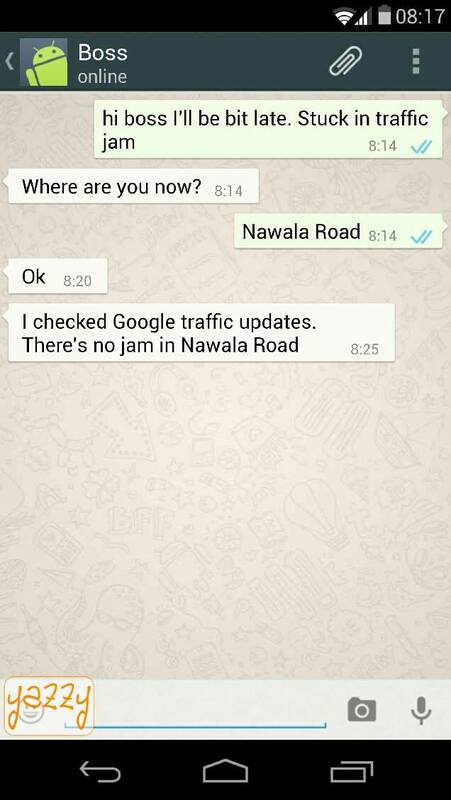 BTW, with Google traffic updates now enabled for Sri Lanka, we will see real conversations like these very soon. So I’m sure you got a pretty decent idea about how Google Traffic Updates work on Google Maps. Next time you drive to work or back home, make sure to check the Colombo traffic updates on Google Maps. But please don’t use your smartphone to check the traffic updates while you drive! It’s better to get to where you want to go a little late, rather than not getting there alive at all.